Something simple but profound struck me this morning. Our living room looks much more spacious when everything is in order- in its place and well arranged. Are you familiar with this? Try arranging your office table and you’ll discover there’ll be room for more things. 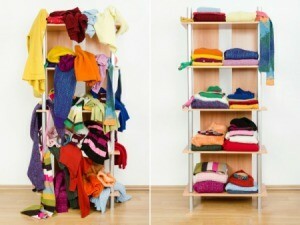 Try arranging the clothes in your closet properly and it will be evident you can still handle a few more clothes. The message is then very clear and simple – order makes for increase. The more organized you are, the more ready you are to handle more! Let me start from what I hope to conclude with – It takes far more time when disorganized than it does when one is organized because disorganized people loose so much time to inefficiency. Have you tried looking for something you misplaced of late? You know the thing is somewhere nearby …maybe in your bedroom. You are dead sure you kept it there the last time but you can’t seem to just find it! The experience can be very frustrating (I get really frustrated) and can make you lose quality time. Can you relate to this situation…or even worse ones? It’s important to note that order makes for increase. A simple illustration to prove this is when you are packing for a trip. If you decide to dump all your clothes and personal effects in a suitcase just like that, the suitcase will be full in no time. However, if you take your time to neatly fold your clothes, and arrange everything in an orderly manner, you will be amazed at how much space you still have for more! If you want to increase in your life, business, career and what have you, pay attention to order. If your life is in order, then increase is guaranteed. If your life is surrounded by clutters and you don’t just seem to get organized, you will have no room for more. There is a mystery about order. Order makes for increase. Anywhere you see order, increase will not be far off. Have you noticed something about developed countries and economies? There is a high degree of order. You’ll see order everywhere. The opposite is true for developing countries and economies. Little wonder why some of us are still where we are! Getting organized is a process and it doesn't happen overnight! It's like quitting a bad habit. In the beginning it is very difficult but it gets easier until one day....you've begun the new habit of "being organized" without even thinking! One of the greatest lesson I have learnt about order and organization is this - “A place for everything; everything in its place”. Let me share with you some tips that I have learnt about getting organized. Some of these tips will work for you, others won't. You don't have to do everything; you just have to do something! Before you leave for home each day, take the time to review your calendar for the next day and prepare any documents that you might need during that day. The truth is that you will most likely not follow this plan 100% but you will be more organized and get more done when you have a clear plan. Assign a home to each item. Where will you put those old bank statements? Where will you keep the magazines? Where should all those design notes go? First go through those items and note what should have been thrown away, then assign a convenient home to every item, you will be much more inclined to put them away in the right place. This is not as easy as it sounds but it is a vital point in creating order around you. It’s not likely that you will be able to do everything you want to do every single day. The chances are that you won’t! When your list of “to do’s” is quite long, you will be more organized of you learn to prioritize. This simply means putting the most valuable items on your “to do” list at the very top of your list. Schedules should follow a progression of priority, energy, and natural setting. My priorities begin with the Lord, then my wife, then my children, then work. When I have time left over, I can dedicate it to items lower on my priority list. I am still leaning on this topic, so, if you have any other idea, the floor is open. Shoot!